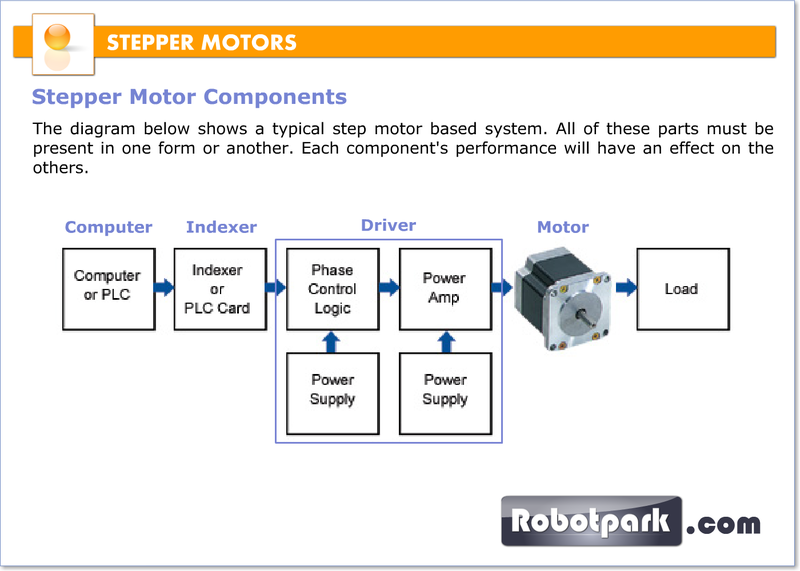 Stepper Motors works in different "Step Modes" which includes Full Step, Half Step and Micro Step and Wave Drive. The type of step mode output of any stepper motor is dependent on the design of the driver. Standard Hybrid Stepping motors have 200 rotor teeth, or 200 full steps per revolution of the motor shaft. Dividing the 200 steps into the 360° of rotation equals a 1.8° full step angle. Normally, full step mode is achieved by energizing both windings while reversing the current alternately. Essentially one digital pulse from the driver is equivalent to one step. Half step simply means that the step motor is rotating at 400 steps per revolution. In this mode, one winding is energized and then two windings are energized alternately, causing the rotor to rotate at half the distance, or 0.9°. Although it provides approximately 30% less torque, half-step mode produces a smoother motion than full-step mode. 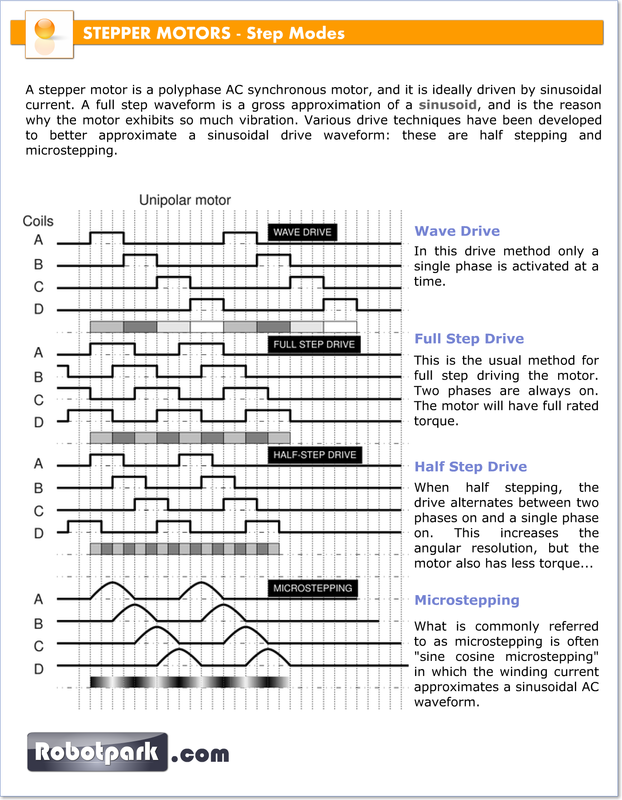 Microstepping is a relatively new stepper motor technology that controls the current in the motor winding to a degree that further subdivides the number of positions between poles. Some microstepping drives are capable of dividing a full step (1.8°) into 256 microsteps, resulting in 51,200 steps per revolution (.007°/step). Microstepping is typically used in applications that require accurate positioning and smoother motion over a wide range of speeds. Like the half-step mode, microstepping provides approximately 30% less torque than full-step mode. 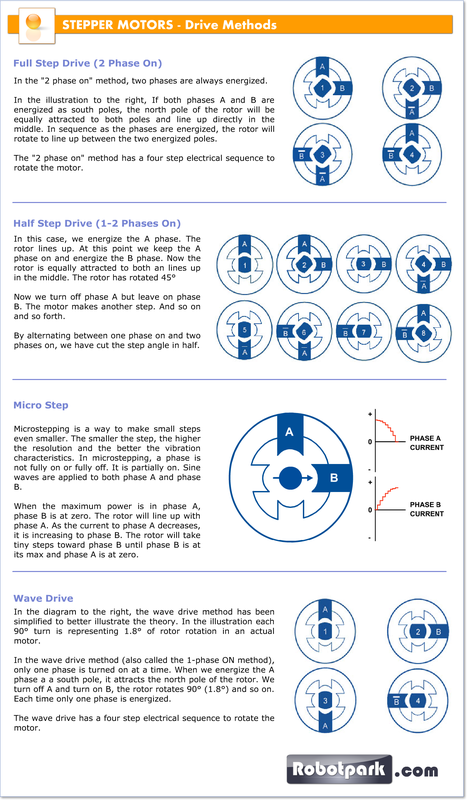 In this drive method only a single phase is activated at a time. It has the same number of steps as the full step drive, but the motor will have significantly less than rated torque. It is rarely used. A stepper motor system consists of three basic elements; Indexer , Driver and a Step Motor. Indexers - The indexer (or controller) is a microprocessor capable of generating step pulses and direction signals for the driver. 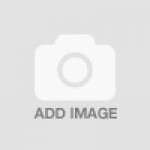 In addition, the indexer is typically required to perform many other sophisticated command functions. Drivers - The driver (or amplifier) converts the indexer command signals into the power necessary to energize the motor windings. There are numerous types of drivers, with different voltage and current ratings and construction technology. Not all drivers are suitable to run all motors, so when designing a motion control system the driver selection process is critical. Stepper Motors - The stepper motor is an electromagnetic device that converts digital pulses into mechanical shaft rotation. Advantages of step motors are low cost, high reliability, high torque at low speeds and a simple, rugged construction that operates in almost any environment. The main disadvantages in using a stepper motor is the resonance effect often exhibited at low speeds and decreasing torque with increasing speed. -Permanent Magnet Stepper Motor: It uses a permanent magnet to operate. It is a low cost and low resolution motor. It also exhibits better torque characteristics than other types of motors. -Variable-Reluctance: This is most easy to understand and most old form of stepper motor. It consists of rotor teeth that become magnetized when attracted to energized stator poles. -Hybrid Stepper Motor: It is more costly than any other type of stepper motor and also it yields the best results. It combines the best features of both PM and VR motors to operate. It has teeth rotor like VR and magnet just like permanent magnet step motor. Robotpark, Robot Shop and Store, Robotic Technology Center.